South Burlingame is a close-knit southwest Portland community with a strong neighborhood connection, family friendly suburban feel, located just minutes from Portland. Offering the convenience of a reasonable commute along with the laid back, natural environment of a small town with quiet streets, perfect for raising a family or owning a first home. South Burlingame is filled with fantastic neighborhood resources, from a nearby branch of the Multnomah Country Library to beautiful parks including Burlingame Park (with plenty of green space and a softball field), perfect for a family picnic or a walk with the dog. Numerous nature trails and environmental preserves create an oasis of green within the city limits of America's favorite green city, Portland, Oregon. One of the older areas of Portland, South Burlingame features homes in the cool shade of mature trees, established neighborhoods with older homes in a variety of styles, and a comfortable family friendly feel. Homes in South Burlingame, like most Southwest Portland communities, have lush, green lawns and larger lots than other areas of town, giving a taste of rural life within the city. There are plenty of shopping areas in the neighborhood, and great dining and entertainment opportunity. South Burlingame was formed on June 7, 1910 when B.M. Lombard, in partnership with Fulton Park Land Company, laid out a plan for section of land that was part of the Fulton Park District. The original Fulton Park District was 411 acres and was formed on July 20, 1888 when Philip A. Marquam sold the land to the South West Portland Company for $150,000. According to some long time residents of the SW Portland area once called Carson Heights - now known as South Burlingame - hummingbirds were plentiful and this area was often referred to as Hummingbird Hill. The South Burlingame district is located directly southwest of downtown Portland. The neighborhood's boundaries are not a grid like some neighborhoods on Portland's east side. The South Burlingame neighborhoods is bordered by Interstate 5 to the northwest, SW Miles street to the north, SW Brier Street and SW Canby Street to the northeast, SW Boones Ferry Road to the southeast, SW Taylor's Ferry to the south, and SW Spring Garden St to the Southwest. South Burlingame borders Hillsdale, Corbett-Terwilliger, Collins View, Marshall Park, Marquam, and Multnomah Neighborhoods. South Burlingame features many beautiful homes with well-tended green lawns and large lots shaded under mature trees, with easy access to neighborhood amenities. South Burlingame features many homes built from about the 1940's through 1980's although a few older and newer homes are mixed in. Typical home styles include broad ranches from the 60's and 70's, some contemporary, and some two-story traditional, "Old Portland" designs. If you are interested in buying or selling a home in South Burlingame, check out our Portland Real Estate Home Page for more information about the McDonald Group Realtors and visit our Portland Real Estate Map to search for South Burlingame homes for sale. Hillsdale Library (1525 S.W. Sunset Boulevard, Portland, OR 97239) : South Burlingame is located right next to Hillsdale, home to one of our favorite libraries. The newer library building was awarded LEED Gold certification as a "green building" in 2004. A number of design elements contribute to the building's official "green" status, including access to public transit, water and energy efficiency, materials that come from local manufacturers, and high indoor air quality. Hillsdale boasts a large collection of books as well as audio and visual materials, periodicals and electronic resources in English, Spanish, Russian, and many other languages. Hillsdale customers have access to Multnomah County Library's system-wide catalog of two million books and other library materials. The Multnomah County Library is the best library system in the world! South Burlingame Neighborhood Association - SBNA is involved in many events. Some neighbors like to organize events like picnics and block parties. Others prefer to work around environmental issues, where neighbors participate in park cleanups and stream restorations, while other neighborhoods are involved in land use issues, carefully monitoring livability concerns. All activities make a differece and there is bound to be something that appeals to everyone, so go to a meeting to find out how you can get involved. The South Burlingame Neighborhood Association meets every second Wednesday at Capitol Hill School (8401 SW 17th) at 7 pm. South Burlingame Neighborhood Sustainability Comittee: This year, a group of neighbors decided they wanted to share and spread ideas of sustainability, eco-awareness, and green living to their neighborhood. The South Burlingame Neighborhood Sustainability Committee was born, a group of like-minded individuals bringing together neighbors and friends to make a difference. For its first year, the group decided to focus on ways people can bring environmental awareness and principles of sustainability to the outdoors, in lawn care, gardening, composting, and neighborhood green spaces. Plans include a summer garden tour (vegetables and flowers invited! ), movie and discussion potluck gatherings, helping Friends of Trees plant street trees, and a message board in Burlingame Park for spreading tips and information, among other exciting events. Burlingame Park: SW 12th Ave & Falcon St - This family-friendly park has been a neighborhood favorite since 1949. Includes play area, paths, picnic tables, playground, soccer field, and softball field. South Burlingame real estate residents are able to complete their shopping trips in a convenient central location, as numerous stores, bakeries, coffee shops, and eateries are all located just off SW Capitol Highway and Interstate 5. 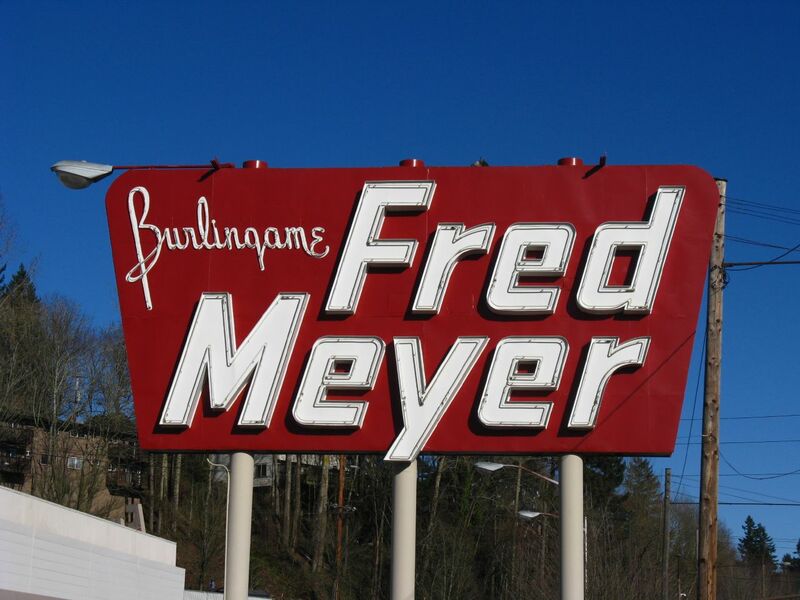 The Burlingame Fred Meyer is a one-stop-shop for everything from cooking supplies to groceries to hardware and drug store needs. The store will be getting a sustaibility upgrade in 2011 - modernization will result in a food-oriented store with many sustainable features. (The store’s original and well-known sign on Southwest Barbur Boulevard will stay as a reminder of the store’s history.) You've got quick access to banks, dry cleaners and laundromats, clothing stores, ice cream shops, a pharmacy, pet wash and vet, the post office, and a video store. One of the area's favorite stores is the Food Front Cooperative Grocery, located at 6344 SW Capitol Highway. This member-owned CoOp brings stellar produce, groceries, and supplies to Hillsdale residents. While everyone is welcome to shop at the CoOp, members have special privileges and benefits, and support their local community. Otto & Anita's European Restaurant - 3025 SW Canby St - Friendly, family atmosphere serving up some traditional German dishes like spaetzle and sausages. It's the only place besides grandma's where you can have liver and onions. And everything's a bargain. Hillsdale Brewery & Public House: 1505 S.W. Sunset Blvd. Portland, OR 97239. This historic spot is located on the old homestead of Hillsdale's founding father John Addison Slavin. See that big, bowl-shaped planter in front of the bar? It originally held the mash for the company's very first on-site brew, crafted in October 1985. And that framed piece of scribbled-on paper near the door? It's the original brew sheet for that first brew. This pub holds a special place in the hearts of our McMenamins brewers, and in Northwest brewing lore as being among the pioneering brewpubs in the state — stop by to learn the whole story. Village Hut - 7647 SW Capitol Hwy - This charismatic neighborhood grill resembles more of open-air food bazaar and offers out-door seating in the midst of a collection of small intimate outbuildings and canopies. The owner is super helpful and friendly, and you can tell he takes pride in the product he puts out. Three Square Grill: This local favorite is the place to go for comfort food in Southwest Portland. Chef Dave has a knack for taking an old recipe and turning it into something that you'll swear is brand new. They've got a great revolving menu based on local ingredients. Most hole-in-the-wall places wouldn't stand a chance if you judged them from the outside. Ironically, though, these are often the places that have the best food in town. Three Square is definitely worth another look. Salvadore Molly's: This Caribbean/Asian fusion restaurant is famous for their Fireball Challenge featured on the Travel Channel's Man vs. Food, and can certainly serve up some spicy cheese balls. Molly's has a great atmosphere, and a fun bar area with a very inexpensive happy hour. We love their fish tacos and garlic lime chicken soup. Their menu is a unique blend of tropical, bold flavors from all over the world. Check them out!